Cormac McCarthy’s The Crossing isn’t so much concerned with the violent and sudden breach of clearly demarcated borders as much as it is with the slow bleed-out and eventual death of innocence, tradition and stability. There’s a parallel to be found between Billy’s journey from affectionate and naive purity to hardhearted maturity (via, of course, the violent upheaval of cruel experience), and the changes that the American South underwent during the sudden industrialisation of the early Twentieth Century. It’s almost a truism for reviewers to draw a distinction between the literal crossing of borders undertaken by the book’s protagonist (America to Mexico), and the subtextual crossing of child- into adulthood; but there’s also a third implied narrative, one that concerns itself with national identity, with the U.S as a frontier nation, in a state of perpetual flux. It’s telling that McCarthy begins the novel with an assertion that the country “was itself little older than [a] child”, and ends with an allowance that “The past is always this argument between counterclaimants. It is history that each man makes alone from what is left. Bits of wreckage. Some bones.”. It’s these more allegorical boundaries which, much like its predecessor All the Pretty Horses, firmly establish this novel as a uniquely American bildungsroman. The Crossing tells the story of three journeys made by teenager Billy Parnham from his home in New Mexico down into Mexico proper, all in the late 1930s. The first expedition sees him attempting to lead an injured, pregnant wolf back to her home territory; in the second journey he travels even further south, looking for the horses stolen from his family; and the third crossing sees a hardened yet defeated Billy searching for his missing younger brother, Boyd. The book doesn’t quite hark back to the levels of cruelty and darkness that McCarthy displayed in his earlier output (Blood Meridian, Child of God, Outer Dark being the most nihilistically exposed of his opus), but it is nonetheless unremittingly bleak and violent; a definite system shock when compared with the relatively more optimistic tone of its sort-of prequel, the aforementioned All the Pretty Horses. The heartbreaking and insistent sequence of tragic events that punctuate Billy’s journeys and which all encapsulate some form of loss (both literal and figurative: his family, his home, his innocence) do run the risk of overwhelming the reader, or even verging on the self-indulgent; but separating the book’s more shattering set-pieces are long passages of wilderness writing, which often act as sympathetic fallacy for Billy’s situation – dark and tempestuous when he’s at his lowest ebb. This not only imbues the book (and Billy’s journeys) with an impressive sense of scale and majesty, but further establishes the notion that The Crossing is as much concerned with America as nation and landscape as it is with the struggles of its individual characters. Stylistically, The Crossing is characteristic McCarthy: long sentences constructed in polysyndetic syntax are very much the grammatical standard, with a striking and only occasionally tedious penchant for meticulous physical descriptions. As with all McCarthy novels, there’s also an attendant lack of punctuation: no marks to indicate direct speech, very few apostrophes (even when they’re grammatically appropriate) and even fewer commas. The winter that Boyd turned fourteen the trees inhabiting the dry river bed were bare from early on and the sky was gray day after day and the trees were pale against it a cold wind had come down from the north with the earth running under bare poles towards a reckoning whose ledgers would be drawn up and dated only long after all due claims had passed, such is this history. I’m tempted to make some twee comparison between the barren emptiness of the book’s landscapes and the typographical ways this is reflected in the absence of punctuation, but there’s really only a very limited extent to which even I could draw-out such a trite association. Ahem. I will, however, remark on the unusual sense of power that McCarthy’s prose seems to carry. There’s something about his narration that’s so heavy and authoritative, as if Cormac McCarthy isn’t describing his personal vision of America, or giving us some lyrical interpretation of a subjective point of view; he seems, rather, to be telling things exactly as they are, as if he’s carved into stone an absolutely inviolable and sacred record of the world in its making. I’m not sure how he achieves this: maybe it’s the sheer length and microscopic focus of his descriptions coupled with his lexicon of earthy, physical words, or maybe the simplicity and directness of his writing contains some biblical and hypnagogic quality that transcends the usual vagaries of fiction writing to imbue upon The Crossing a sense of absolute authority. Either way, the book almost defies its notional identity as a novel to feel, instead, like some kind of definite, objective and truthful record of America. This is exacerbated by the book’s unsympathetic treatment of its readership; with almost all of the dialogue rendered in unstranslated Spanish, there’s a faithfulness to realism that’s given precedence over the needs and concerns of the individual reader. The Crossing is an extraordinary novel. It’s difficult to discuss the finer points of its plot without resorting to massive spoilers, but Billy’s compassionate treatment of a trapped wolf that is the book’s beginning, and his violent attack against an old dog that is the book’s end should give you some indication of the bleak and pain-filled journey contained within the intervening 400 pages, and of the histrionic and deeply moving changes that effect and re-mould the perennially lost protagonist. It would be somewhat amateurish of me to list, verbatim, all of the different ‘crossings’ (metaphoric or otherwise) that dominate the book, but I couldn’t help but feel that the most significant journey is the one that none of the characters ever truly accomplish: to cross the vast landscapes between one another, and to stop themselves from ever feeling acutely and profoundly alone. This entry was posted in Novels, Reviews and tagged Cormac McCarthy, The Crossing. Bookmark the permalink. As you know I loved this book and I do also enjoy how much more I get out of reading it having read and appreciated your views. You bring such depth, insight and intelligence to both the macro and the micro view of the story and introduce me to new words each time – ok bildungsroman – sounds German, looks half French, you’re describing something American and I guess you learnt the word in Wales – very worldly wise! Regarding the lack of punctuation, I find it lends his work a kind of purity or removal of the underlying authority, in that punctuation is like an inherent set of instructions which demands that you pause here, stop there, continue for a longish time here, listen to a voice here. What McCarthy effectively does is provide a freedom to the reader in the way they read, and to find their own rhythm – also in a visual sense, he has created a more fluid work. Unencumbered, it certainly inspired me to have a go with a piece of flash fiction, I’ve discovered I like reading without the rules. I think the last journey that you describe, the one they have not yet taken, is one that only wisdom can bring and will require years, should they manage to survive that long – I guess we may or may not find in the next book – or perhaps he will leave it to the imagination. Thanks for another excellent review and reminder of a great work. Thanks for being so kind – I feel very undeserving, but thank you nonetheless. ‘Bildungsroman’ is a German genre of writing that materialised in the late 18th Century. ‘Bildungsroman’ books are basically coming-of-age or ‘journey of self discovery’ novels., and while the word does, technically, refer to a specific time and place in literature, these days the term ‘bildungsroman’ has a much more general use, and is often used to describe any coming-of-age story, regardless of whether or not it belongs to the original German novelistic genre. I like your ideas about McCarthy’s use (or, rather, non-use) of punctuation; and I agree that language should never be a slave to grammar (if anything, it should be the other way around). His lack of punctuation definitely serves a visual as well as aural purpose, I think. The fact that his work isn’t peppered with tiny little curls and dashes and other such marks definitely gives his books a typographical identity truly there own. I wonder whether a Cormac McCarthy audiobook would be a very different literary experience from reading his text itself, as the *look* of his writing is as much as part of its aesthetic identity as his choice of words, I feel. Yet another fantastic review, Tom! I’m a big McCarthy fan, but find his writing very difficult to talk about/describe – but I think you really get at the kernel of it here: it’s something about that combination of the sublime and the raw, the lyrical and the gritty, that gives it its unique power. “as if he’s carved into stone an absolutely inviolable and sacred record of the world in its making” … It’s hard not to start writing *like* McCarthy when you’re writing *about* him, isn’t it? Hehe. Many thanks. 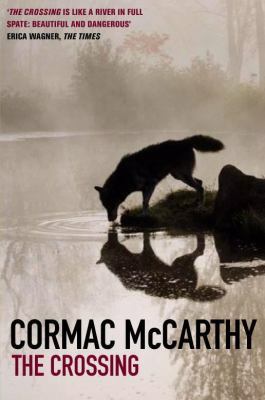 Love me some Cormac McCarthy too; but likewise find him very difficult to write about. Also, whoops: I was re-reading big chunks of the book as I wrote this, so his style must have seeped into my consciousness. I was tempted to write an entire review without any commas but, darn it, doing so is much harder than it sounds: you can’t just delete them, you need to completely re-word/re-order every sentence. Thanks for stopping by and commenting. Tom. Hahaha, that’s amazing. I like: “make sure to pick up ‘Philip Roth Balderdash'”. Teehee. The other essential crossing that the novel explores is that between life and death. McCarthy’s work has grown increasingly theological over the years, and the notion of a “beyond”, a transcendent “otherplace” is very strong in The Crossing.